We are strongly opposed to anorexia and crash diets. Our objective: Long-term body shaping effects without the promise of “miracles” and an overall improved physical performance in your everyday life. We don’t offer miracle pills or tell you that you will lose weight without exercising - what we can tell you is that the products we have developed will definitely help you achieve your goals faster. "Our products support your figure training and will help you achieve your beach body." We are very proud of our Shape Shake, a protein shake developed specifically as a meal supplement as part of a body shaping fitness regime. What’s so special about our Shape Shake? It gets rid of hunger pangs and is designed to provide exactly what your body needs as part of a figure training fitness regime. It contains premium quality milk from free range grazing cows. 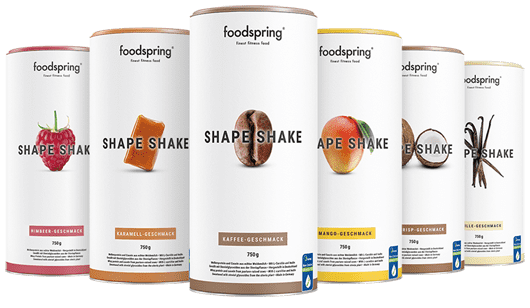 "The body shaping products by foodspring are developed in accordance with the latest scientific findings and are manufactured in Germany to strict quality standards." 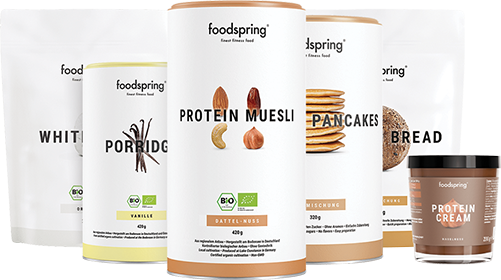 All body shaping products by foodspring are manufactured exclusively in Germany and are subject to the highest quality requirements in accordance with HACCP and ISO standards. 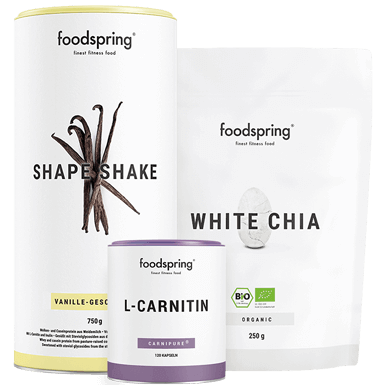 The development of each individual foodspring product is based on the latest scientific findings in the field of nutrition and the latest studies in the field of dieting. We are strictly against anorexia and crash diets. These are not successful long term and are a huge strain on your body. They are also lacking in important nutrients like proteins, carbohydrates, fats, minerals and vitamins. The consequences are often intense cravings or the yo-yo effect after ending a diet. The foundation for any weight loss diet is nutrition. Only a negative energy balance and a balanced distribution of nutrients lead to long lasting shaping. Basically, food intake needs to be heavy on protein during the reduced calorie phase. Proteins simultaneously supply our muscles with all essential nutrients. Our shaping products are designed for successful long-term shape training. Apart from high quality proteins, Shape Shake contains the natural fibre inulin from chicory roots, is good for gut flora and prevents unwanted cravings. The addition of L-carnitine rounds up the formula for our Shape Shake. This amino acid bond helps with ideal body toning. Our Shape Shake is wonderfully suited for maintaining a negative energy balance. Supplement one meal a day (e.g. lunch, dinner) and save calories, because this protein shake is low in calories and rich in fibre and so helps you eat smaller portion sizes than usual. Green tea extract and guarana extract have proven to have a positive effect on thermogenesis. This advantage is the core feature of Shape Caps, our very own shaping product. Shape Caps combine the most promising ingredients in the diet market and support metabolic processes involved in shaping. The individual ingredients such as L-carnitine, guarana extracts and green tea extracts, as well as Q10 have been researched in scientific studies and determined to be perfectly compatible. 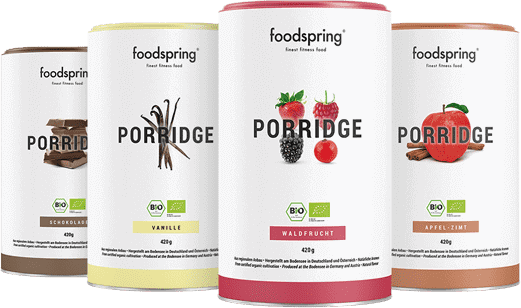 Apart from protein rich meal supplements, we have also developed a special porridge with more than 20 grams of protein in a 100 gram serving, that you can include in your protein rich diet as a healthy way to start the day. The primary raw materials in the protein porridge are Bioland-certified soy beans that are exclusively cultivated with water from the Lake Constance region. This unique selling point spells highest quality for our ready-to-eat porridge. For those that follow a vegan diet or wish to avoid allergens like lactose, soy and gluten as much as possible, we have developed vegan protein. Vegan protein is characterized by a high biological value of 116 and is rich in fibre because of its high brown rice content. This makes it hypoallergenic. Since a sufficient supply of high-quality protein is essential for any long-lasting success, vegan protein is the perfect supplement for a body toning meal plan and is perfect as a protein-rich snack. Success can be maximised and achieved quicker with an accompanying body training program. Studies show that a combination of effective weight training and endurance training has a positive impact on burning excess body fat. The intake of essential amino acids such as BCAAs directly before a training session on an empty stomach prevents muscle loss and protects the body’s own protein building blocks. For this reason, BCAAs should be taken before intensive training sessions for weight loss. For best results, weight training should be carried out in addition to an intensive endurance workout. High intensity interval training with varying intensity levels are well suited for this. Endurance training can either be done following weight training or in the morning on an empty stomach. While training on an empty stomach, it is recommended that BCAAs are consumed before hand in order to prevent muscle loss. Aside from providing you with products like our shaping products, we are at your beck and call as consultants to support you on your journey. We are happy to take the time to answer all of your questions related to body toning. You will finddetailed informationon meal plans for every type of goal as well as complete shopping lists in our Coach section. Apart from this, you can create your own nutrition log and let our experts assess it. Use the option to contact our nutritionists, let them advise you on an individual basis and receive tips on training as well as proper nutrition for body building. Along with live chat on our website or our Facebook page, you can also email us at service@foodspring.dk or get in touch directly via telephone at +49 (0)30 208 499 10 to speak with our experts and receive free, non-binding consultation - we look forward to hearing from you.